Living in neighborhoods compounded by violence and simultaneous gentrification, Oakland youth – with the support of the Pacific Institute and Communities United for Restorative Youth Justice (CURYJ) – have released the “foto-novela” Forgotten Voices to share their experiences and vision for creating opportunities for men of color. 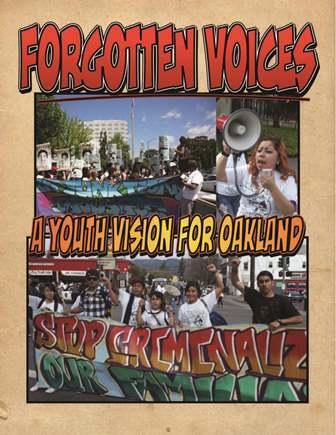 The foto-novela, available in both English and Spanish, comes out of the organizations’ Youth Empowerment Zone Project which aims to build the leadership capacity of young people directly impacted by proposed gang injunction ordinances in Oakland’s Fruitvale District. “Forgotten Voices is compelling documentation of how to build healthy communities and bottom-up power. These aren’t top-down ordinances, but solutions from the ground up that reflect the patterns in youths’ shared experiences,” said Ruben Leal, a community organizer with CURYJ. In a community where violence prevention strategies have criminalized the very youth the policies are meant to protect, the Youth Empowerment Zone Project created Community Research positions for the young men of color listed in Oakland’s gang injunction ordinances, recognizing them as thought leaders on youth violence prevention and community safety issues. Together and with the support of seasoned community activists and researchers, these “Hood Reporters” have created a comic-book-style short story which features photos taken by the youth and dialogue they have written to identify issues of concern in their communities, document community conditions, and generate solutions to create healthier communities. Reducing youth violence will be key for Oakland to build healthy communities over the long term. By developing a youth-led vision in East Oakland that identifies specific improvements for existing violence prevention programs and services as well as broader policy and systems changes needed to support young people’s development, the Youth Empowerment Zone Project has provided these young men with the relevant resources, support, and opportunities to become positive forces for change in their communities. Forgotten Voices is a tool that communities can use to build community power by lifting up the knowledge of those directly affected by violence, building a shared analysis of the root causes of violence based on lived experiences, and generating policy solutions that address these root causes. Download the foto-novela Forgotten Voices in English (PDF). Descarga el foto-novela Voces Olvidadas en Español (PDF). Download the foto-novela Forgotten Voices in English and Spanish (PDF).